Also published in the newspaper B.T. in Denmark, March, 11., 1978. 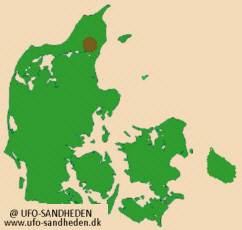 "In the spring of 1954, I stood in the park with my mother in Gug near Aalborg, Denmark. The sun was shining from a cloudless sky, and everything was calm. A wonderful spring day. My mother was in the garden and I was looking at a bird, when I suddenly saw five huge, all noiseless silver glossy cigarformed UFOs." "They flew in formations like the wild ducks do. I followed them a couple of seconds, and then called my mother, and we watched them for awhile, they moved fast but with no sound. My mother called our neighbour, that were walking on the other side of the hedge and said: "Look, Karen, look at the flying saucers", however in that second the UFOs disappeared, as if we had an on and off switch." "We never told anyone about our observations, in fear that no one would believe us."